There is no doubt that the fashion industry has come a long way. If we focus specifically on men’s fashion, it is safe to say that it has seen a lot of variations and changes over the past few decades. Clearly, it is hard to keep up with the ever-so-changing men’s fashion. Every season, there are new clothing styles in vogue, making fashion influencers, lovers, and enthusiasts to try them to stay relevant in today’s age. Discussing every aspect of men’s clothing is not possible in one go. Therefore, today we have made one major part of men’s clothing the focus of our discussion i.e. men’s pants! Any outfit is incomplete without a good pair of pants which is why it is imperative for men to take time when shopping for quality pants. Choosing wrong pants can instantly ruin the overall appearance of any man regardless of how amazing other their clothing items are. One of the few things that a beholder may notice in men is their dressing style. The observer takes into account the kind of outfit they are wearing and while doing that, their attention is immediately shifted toward their pants. If your pants are neat, smart, and well-fitted, you will instantly earn brownie points. Otherwise, the only thought that would linger on in the mind of an observant would be about your questionable taste in fashion! If you want to impress your date, colleague, or a friend, investing in the right quality of pants is a must. With so many men’s pants options on the market, each touting the best of all, it could be hard to decipher which is an ideal one for you. To make the decision-making part easier for you, we have assembled some of the popular types of pants for men. Read details to understand each type of pants and decide for yourself which of them will be perfect for you. From time immemorial, jeans have been a staple element of men’s everyday wardrobe. But the confusing thought that occurs to every man at some point is – out of so many different types of jeans which one should I pick? Let’s break it down all the popular kinds of jeans to you so that you can choose better. 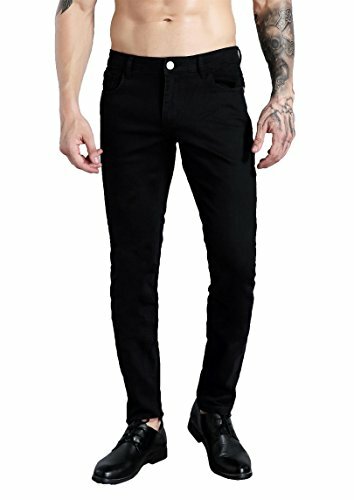 They are a common pick among men who aren’t too bulky or thin and let’s just say these pants look mighty good on them. No exaggeration. Regular jeans are the ones that fit from hips all the way to your thighs. Interested buyers must know that every brand has these traditional jeans in varying measurements. Generally, they have a mid-rise and a wide leg opening. The relaxed style makes them one of the popular picks for everyday wear among men. Despite its immense popularity, most men are not aware of the meaning of “skinny jeans”. These types of jeans are meant to be tighter from the waist till your ankle. The downfall of skinny jeans is that they do not offer much mobility to the wearer. If comfort is your aim, we’re afraid that skinny jeans may disappoint you. However, they serve as a perfect style statement, making you appear smart and classy. Overweight men may be hesitant to slip on skinny jeans. For them, a better alternative is to invest in relaxed fit jeans. This is the type of jeans that gives enough breathing space and makes the wearer feel comfortable too. You can easily wear them for longer hours as they prevent you from sweating and cause no skin rashes. So if you want to try a looser version of skinny jeans, go for these jeans right away! Low-rise jeans are typically worn at hips, slightly below the waistline. The trendy jeans ruled in the 60s’ and 70s’ fashion world and have recently made a revival. Low-rise pants are an ideal option for tall men seeking for a casual look. If you have a short or average height, then low-rise jeans wouldn’t be the best pick. That’s because they will make you appear shorter than you already are. Also, people with shorter legs and a longer torso should also steer clear from low-rise pants. Low-rise jeans are also available in a baggy style. However, these types of jeans are not every man’s cup of tea. Young men with cool style usually prefer low-rise baggy jeans. Before you buy them, always try them out first to see if they fit you well and look good on you. Khaki pants are a popular choice among men looking for both comfort and style. They are usually made of cotton which makes the wearer feel super relaxed. The best part about these types of pants is that they go well with all kinds of shirts. As the name suggests, these pants are mostly available in khaki color which is “yellow-brown”. However, if you are looking for khakis in distinct shades, you will be glad to find out that they are also sold in hues such as black, navy, and khaki beige. You can sport khaki pants for both casual and formal events. Most men often wear them to work on “casual Fridays”. If you are also planning to consider chinos for your workplace, then don’t forget to pair them up with a collared shirt that has your company’s logo. Chinos are often mistaken to be khakis, but mind you, they are not! They are made from both synthetic and cotton materials, providing optimum comfort to the user. What sets them apart from khakis is the fact that these fancy pants have a little bit of sheen to them, making an ideal choice for formal affairs. You will mostly find fashion-forward employees sporting these pants to work. Although chinos make the best office wear option, they can also be considered for casual events like a get-together party or lunch date. But bear in mind that when you are leaning towards a more casual attire, ask the shopkeeper for casual chinos. Don’t end up purchasing formal chinos! To round up your look, pair your chinos with a nice-colored plaid sport shirt or a blue/black chambray shirt. Take your look to a whole next level by rocking your favorite sneakers. Easy, isn’t it? Remember readers – chinos come in two great styles: slim chinos and wide-leg chinos. Slim-leg chinos are a wardrobe classic and are as versatile as it gets. Team them up with your favorite shirt and blazer and you are good to go! When it comes to wide-leg chinos, they are usually favored for a laid-back, cool look. Compared to slim chinos, they are looser, making them the nicest and breeziest pair of pants. Style the coolest pants with a boxy t-shirt and a hoodie. And opt for your everyday low-top trainers to seal the look entirely. Going for a hike or trek? Go for cargo pants! Why do they make an ideal choice for hiking, trekking or any other activity that involves a lot of strength and movement? That’s because they are loose, baggy, and the best of all, made of thick fabric that will keep you safe, secure, and comfortable. 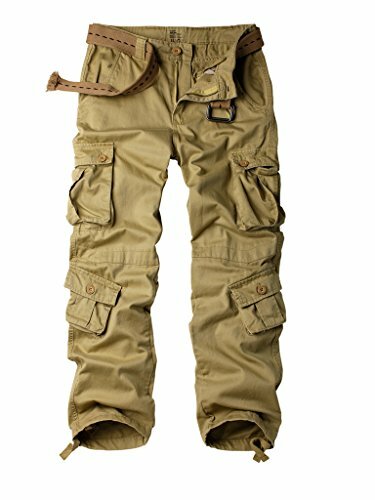 You can easily move around in a pair of cargo trouser/pants, allowing you to easily carry out an outdoor activity without any hindrance. If you think that these pants will give you an outdated look, you are quite wrong. Cargo pants happen to be one of the most fashionable pants ever. These are the types of pants that offer both comfort and style – more like a two-in-one deal! In addition to comfort and sleek look, cargo pants offer many other benefits too. One of them is the variety of colors these pants are available on the market. You can also find them in shorter lengths which are perfect for hot seasons. Not sure how to style them? Well, try wearing them with a wool overshirt or knitted roll neck and a pair of incredible ankle boots. This style is reserved for winters so adopt it during a colder season. In summers, pair up your cargo pants with a white or black tee and a stylish button down shirt over it. For footwear, go for either slip-on sneakers or plimsoll sneakers. Choose either of them and upgrade the look. Sophisticated men looking for a classic look should know that pleated pants are the ultimate way to go. These are the only pants that are common with men of all ages and personalities. Whether you’re attending an office meeting, going for an interview, or simply hanging out with your buddies, pleated pants will make you appear super smart. Other praise-worthy features of pleated pants are that they are quite roomy and flexible. Don’t worry. The pleats of these pants won’t give you a baggy look. If you haven’t sported pleated pants before, you must know that the pleats of the pants are only at the above and front part of the pants. If you are not a fan of lots of pleats, then you will be glad to know that there are also pleated pants with only a single pleat. Pleats are usually long and vertical and vary in numbers ranging from one to three or more! Overweight or short men should avoid wearing pleated pants as these pants can make them appear heavier and smaller respectively. Are you looking for the ultimate casual-wear? Look no further than sweatpants. There was a time when they were strictly considered as gym-wear. But not anymore! 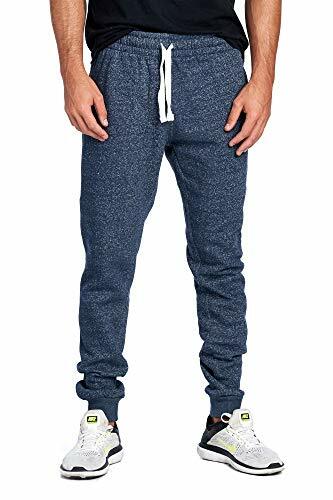 Men can easily sport sweatpants while shopping, attending carnivals or casual dining. Although they are the most relaxing outfit, if not styled well, they could be the least flattering one. To appear impressive in sweatpants, remember to go for a pair that is a perfect fit to you. Ideally, they should be narrowed down from your knees and must be loose from the thighs and crotch. Stick to comfort shoes like converse, chukkas, loafers, boots, or high-top trainers. The choice of shirt will be essential for making sweatpants work for men’s looks. To avoid appearing sloppy, men should choose a well-fitted shirt with a chunky cardigan and a hoodie. Other than sweatpants, for more casual styles, men can opt for tracksuit pants and joggers. Whichever pants you choose, make sure that they fit you right and make you appear dashing at the same time.